At his Riverside plastic surgery practice, Dr. Christopher Chung has announced the release of a new website to highlight his services and available procedures in cosmetic enhancement. Dr. Chung focuses on a wide range of aesthetic treatments, including breast augmentation, liposuction, and dermal injections such as BOTOX® Cosmetic. He says he hopes the new website offers patients a resource for finding the information they are looking for in order to achieve the highest quality cosmetic results. Dr. Christopher Chung, a board-certified plastic surgeon in Riverside, CA, recently released a new website for his practice to provide in-depth patient education and an interactive communication hub. Focusing on a wide range of procedures from breast augmentation to liposuction in Riverside, Dr. Chung says he is excited about the new website and the opportunity to reach more patients and continue his pursuit of the highest quality patient care in the online medium. He also says the new website will provide patients with an extensive database of information on aesthetic treatments and procedures. Featuring drop-down tabs that link to thorough procedure information as well as an expansive layout, Dr. Chung’s website offers patients the chance to educate themselves about plastic surgery and cosmetic enhancements before an initial consultation. Dr. Chung says he hopes the site will give patients preliminary information so they can make responsible, educated decisions regarding their aesthetic needs. With the addition of a blog and contact form, he also says patients will have the opportunity to communicate directly with his practice through a facilitated and modern channel, enhancing the level of patient care available. Through collaboration with Rosemont Media, a San Diego-based medical website design firm, Dr. Chung says he custom-created his site as a way to reiterate his commitment to his patients’ comfort and satisfaction. He says he is excited to enhance doctor-patient interaction and give people a more integrated role in the plastic surgery process. 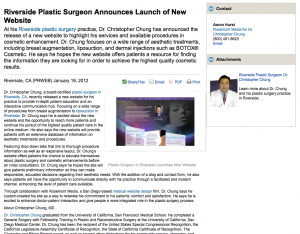 Dr. Christopher Chung graduated from the University of California, San Francisco Medical School. 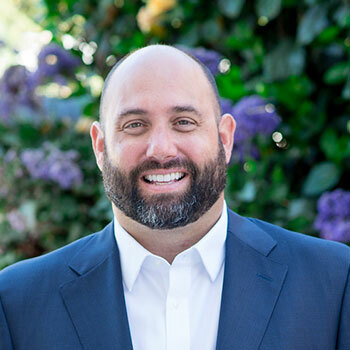 He completed a General Surgery with Fellowship Training in Plastic and Reconstructive Surgery at the University of California, San Diego Medical Center. Dr. Chung has been the recipient of the United States Special Congressional Recognition, the California Legislature Assembly Certificate of Recognition, the State of California Certificate of Recognition, The Character and Ethics Project award, as well as several other distinctions for his community service, character, and ethics. He is a diplomate of the American Board of Plastic Surgery and a member of the American Society of Plastic Surgeons. Located at 2815 S. Main Street Suite #110 in Corona, CA, Dr. Chung’s practice, Renaissance Aesthetic Surgery, can be reached at (951) 278-8385. It can also be contacted online via the website drchungplasticsurgery.com.